Just installed the AppCode 3.0 EAP build 137.48 and got a warning about not having the latest apple JVM installed to run AppCode itself. This was a bit confusing, since apple abandoned distributing JVMs for osx as of java 6. I have Oracle's java 7 and 8 already installed. It turns out that I did not have the last java 6 update from apple installed, and installing it fixed the error message, but it surprised me to learn the IDE is still running on java 6. I was curious why you have chosen to remain on 6. I'm surprised there aren't performance benefits to the 7 and 8 JVMs that would make it a compelling upgrade. Russell, Oracle 1.7 and 1.8 JDKs have known issues on OS X: first of all, sub-pixel antialiazing is not supported yet also, where is a probem with MacRoman encoding. For now, Apple 1.6 is a recommended JDK on OS X. Thanks, that's interesting. I didn't realize. That's unfortunate. 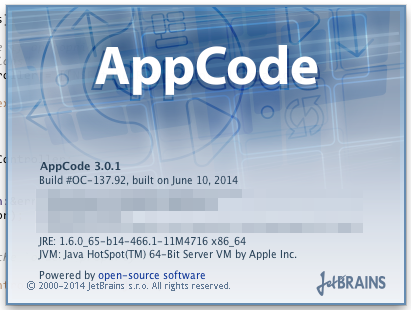 If Oracle hasn't worked them out yet, one wonders how little effort they are putting into supporting the JVM on OSX. Font rendering still looks pretty bad on Mavericks with Apple JVM 1.6. Is there a setting I'm missing? Perhaps it is possible to somehow tweak JVM antialiasing settings that AppCode uses?